I have been put into a month’s signalling course with Middleton, at Chelsea. We do flag drill etc. in Battersea Park. The Guards are full of tricks. When you fall, then the markers are placed the down beats and they all spring to attention, then on the rumpty-tumpty tumpty trrrtrrrumpty they all dress up and keep their heads to the right. Trump! goes the drum, and all the heads click to the front. The flag drill with big flags looks very effective when the sun is shining, blue and white with blue stripe. I called on Mr. Godman on last Friday. He is very well. He talked of his last part of the Biologia ,the very last one. The one but last gave a biography of himself and; what travels and hard work they got through. Three times to Central America, travels over the 5000 mile strip of Mexico and Guatemal, Iceland, Italy and Persia. The travelling was much more difficult then. No easy Cook’s tickets. Mrs. Godman is very pretty. I didn’t see the daughters. They invited me to dinner on Friday and a cinema after. Theatres are too early. 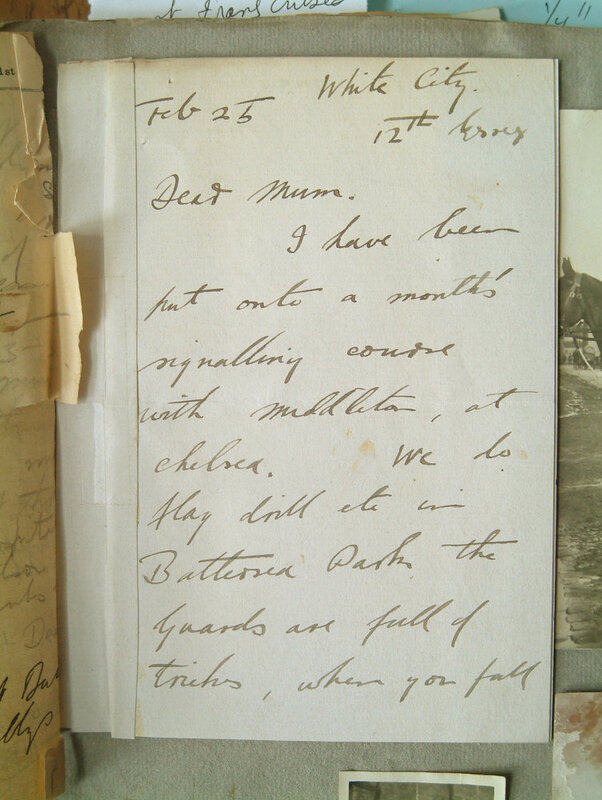 I went to see Aunt Mab and Dad last weekend, Dad has been very seedy with bad fever, and the typhoid inoculation in the hip by Dr. Calverley laid him up still more. I took him for his second little walk last Sunday, down to the lower town. Aunt Mab has been having a tough time, Godfrey being at the front, her son in law in Persia fighting the Turks, her future s-in-l (Kitts) in India relieving the regulars who are in Flanders. Evelyn is very proud of Scott, who came out of the Persian fighting very well. He is occupying Burra. Viola is billeted 3 miles from Hawksfold where Mrs. Tristian lives. Reggie got a little two seater to get about his job with, and she and he will both look up all their old friends. Gran is very fit and lunches me and tea’s me when I can come. She is a regular old war horse; she must have been some girl at 18. I would eat my hat to get a move up into the Signallers--Brigade or Divisional perhaps. 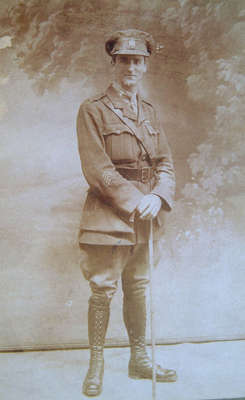 Godfrey is O. C. of the Cavalry Divisional Signal Squadron. I suspect that the well caused Bene’s lumps. Reggie says it probably is the bottom of all the trouble: old Marsh’s rheumatism, Amice, me, Bene. Send a sample in a sterilized bottle to Dr Nesbit, Toronto City Hall. Doesn’t cost anything, and may save a lot of bother. That rain water tank was full of filth, and is only a few yards from the well and drains into it. 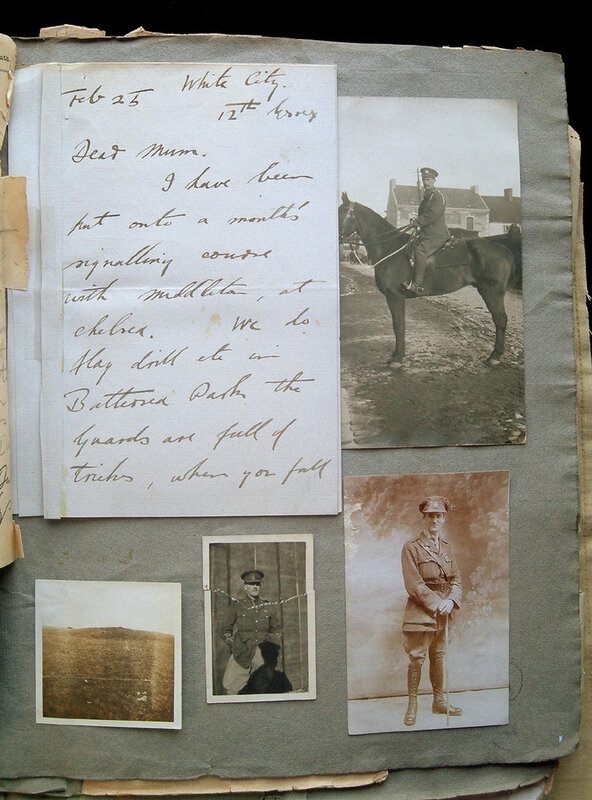 I ought to have written to you some time ago to tell you how pleased I was a short time ago to make acquaintance with Hugh –such a nice looking young fellow in uniform. He dined with us one evening and went to some entertainment with the children (who are both out now), and Alice, afterwards. He has called since but we were all unfortunately out. I must get him to come on and dine again. Of course there is nothing going on in London in consequence of the war, only theatres and shows of this kind. He tells me that he is drilling hard, as nearly all the young men in the country are. There will soon be no young men left. I saw your mother a short time ago and thought her looking wonderfully well again. I was quite delighted. I am just finishing the great book your Father and I began together 36 years ago. It has far exceeded the estimate we made for it, it was to have been finished in 60 Parts, but it has actually taken 216. So we were a little out in our calculations. When you get time send me a line.